Clipper and Magnifique: -25% ! Book a Clipper or a Magnifique for a one week (or more) cruise in 2018 en benefit from 25% discount. This offer is not combinable and is valid for everynew booking made before April 30th. 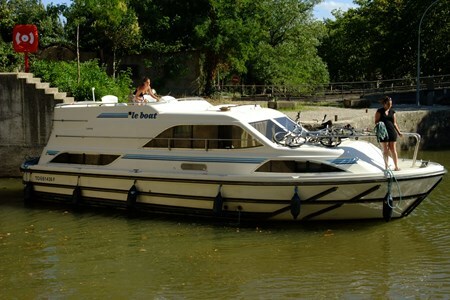 Book a one week cruise in April or in May on the Canal du midi or in Camargue and benefit from a 25% discount! The Clipper is a very comfortable boat which can be sailed without a license. It is perfect for 2 couples or for 1 couple with 2 children. Make a cruise and become the captain! - Living room convertible into double bed (or single bed). - Bow thruster in Italy, Holland and Germany. - Electricity: 230V on board from electrical connector. Group Booking: Save up to 20% when booking more than one boat per Holiday booking, starting and finishing on the same dates. 2 boats: 10 % / 3 boats: 12.5% / 4 boats: 15 % / 5 boats: 17.5 % / 6 boats or more: 20 %. Offer valid for a cruise of one wekk or more. Extended booking: For all cruises of 14 nights or more, receive a 10% discount off 2nd and subsequent weeks. Loyalty discount. : 5% from the second reservation; 7% from the third (may be combined with other offers). Family discount: 5% discount when there is one child under 16 on board. Offer valid for a one week (ore more) cruise. NB: each base owns one private car park or garage. NB: This service is not available on our Vision boats.